You all know these old gangster films where a guy uses a knock sequence on a door to get in? Port knocking is exactly that, just for your server. Changing your default ssh port does not guarantee that you won't get hacked. Hackers often use tools to do automated scans for open ports before they attack a server. Port Knocking is a way by which you can defend yourself against port scanners., it refuses access to a protected port until a client accesses a sequence of other ports in the right order upfront. 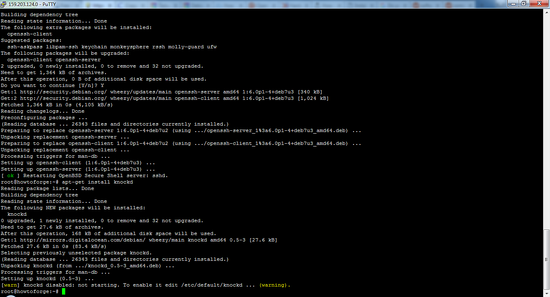 Installing port knocking on Ubuntu is easy. I will show you in this article how to install and set up port knocking. The steps from this tutorials should work for Debian 8 as well. 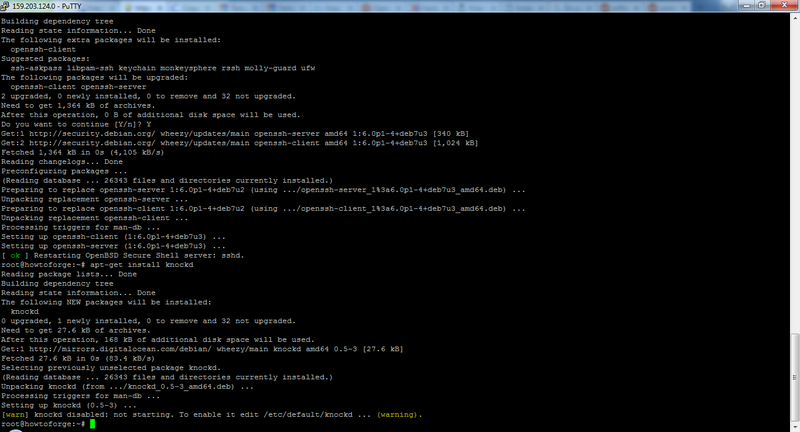 Then install the SSH server (if you have not installed it already). Now install the knockd software which is the daemon that controls the port knocking. 2 upgraded, 0 newly installed, 0 to remove and 32 not upgraded. Need to get 1,364 kB of archives. Press Y then enter to continue. First, we flush existing firewall rules and ensure that outgoing connections don't get dropped. Note: The above rule has no spaces on either side of the comma in STABLISHED,RELATED. Current iptables rules can be saved to the configuration file ?
? /etc/iptables/rules.v4. These rules will then be loaded automatically ?
? during system startup. ?
? Rules are only saved automatically during package installation. See the ?
? manual page of iptables-save(8) for instructions on keeping the rules ?
? Save current IPv4 rules?
? /etc/iptables/rules.v6. These rules will then be loaded automatically ?
? manual page of ip6tables-save(8) for instructions on keeping the rules ?
? Save current IPv6 rules? During the installation, the program will prompt you to save the current iptables rules (ipV4 and ipV6), just select Yes for both. Now, you will remain connected to your existing connection while blocking other connections on the SSH port. Next, we have to configure knockd. You will see the sections that will look like this. Ungerneath, we have two sections: openSSH and closeSSH. The first will allow the knocker to access port 22 (SSH), and the second will close the port when the knocker is complete. knockd automatically replaces %IP% with the IP address of the client that sent the knock, so you can open the port only to the authorized client. This means that this set of rules will match if the same IP requests a connection on port 7000, followed directly by port 8000, followed finally by port 9000. It is highly advisable to change the default ports and their order as the default order is well known to attackers as well. The "seq_timeout" option defines in seconds how long you have time to provide all numbers for the knock. This default value should be fine and won't be an issue if you're automatically generating your knocks. Specify the command to be executed when a client makes the correct port-knock. All instances of %IP% will be replaced with the knocker's IP address. Pay attention to packets that have to be used to set this flag, in this case syn packets. When using TCP flags, knockd will IGNORE tcp packets that don't match the flags. after this save and exit. If you have multiple network adapters or experience issues that knockd is not starting automatically during system startup, you can manually specify the network interface to listen on by uncommenting and amending the second line KNOCKD_OPTS. 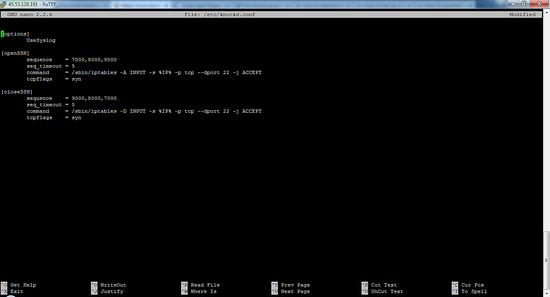 This will start the daemon and allows you to change the iptables rule sets by knocking on the sequences of ports. You have installed the required the packages, if you are disconnected from your server, to reconnect you have to knock the ports that you defined in the right sequence establish an SSH connection. If you have followed the above steps, then you will not be able to connect to the SSH server directly anymore without port knocking. You should receive no response from the server and the SSH client should timeout. 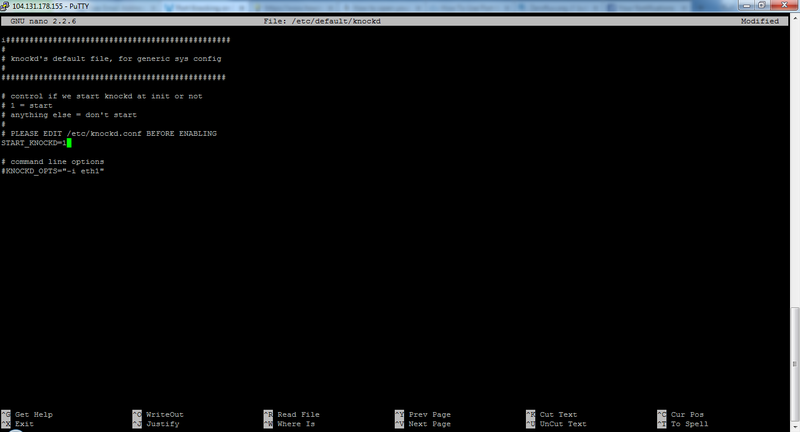 This is because our SSH daemon is currently blocked by iptables. Type ctrl-C to end the SSH attempt if it does not time out automatically. 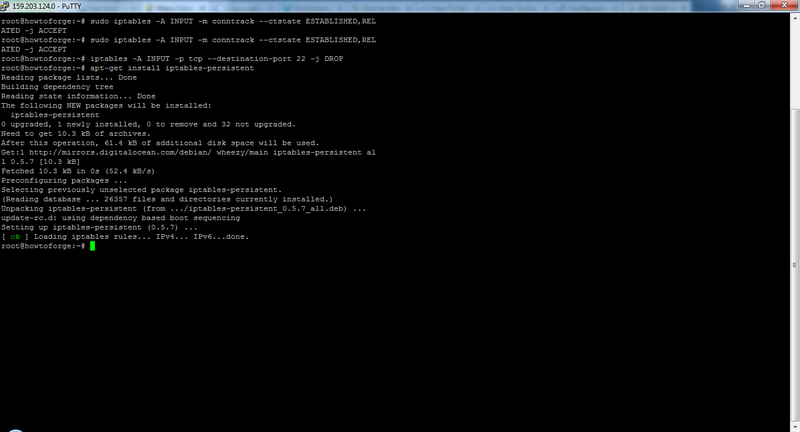 For Linux users: Install the telnet package with apt. For Windows users: you can install the Telnet client by accessing the “Programs” section, search for "Turn windows features on or off", from there enable the Telnet Client. You have to do all this in 5 seconds because this the time limit imposed for the configuration. Now, attempt to connect to your server via SSH. You will be able to access the connection. Run the above commands in reverse order to close the SSH server. The best part of port knocking is that you can configure it alongside the private key authentication. If you configure both, then virtually there is no chance that someone could gain access or connect until and unless they know both the ports and the private key. Does this work on a CentOS server too that I only can work on through SSH? There is no display and no keyboard connected to it. Generally this should work for all Linux distributions. You might have to check where you find a knockd .rpm package. I use a very much simple solution on my servers. 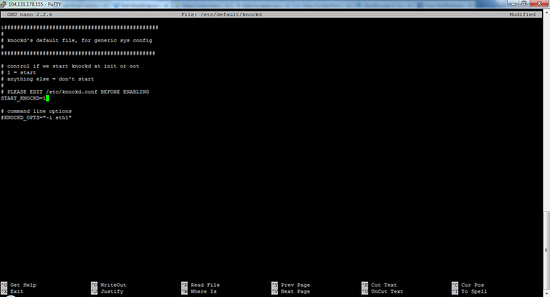 I hide a webpage which unlocks the port 22 for the IP I am calling it from and sends an email to the sysadmin. It is easy, does not need any client except a browser and fairly secure. If the page is found, I just have to rename it and it is not a security issue as it only opens ssh but does not give access.Port knocking is neat but a bit overkill and complicated. Doesn't opening up a web page and port for your solution then expose your machine to hacks on the web server port, possibly exposing that port to hacking vulnerabilities? So you're sort of trading one vulnerability for another? Port 22 will only stay open for excisting connection, so if you got the correct KNOCKING sequence then you can connect to port 22... after the connection is made the port will stay open as stated before. Your ip is only relevant if you combine KNOCKIN and IP SPECIFIC access. then you need to specify your new ip address... but if you only integrate KNOCKING then your ip can change as it wouldnt block you to your server. So how do I combine this with IP whitelisting so it only opens up the port for my current IP address (from which I'm knocking)? I'm connected on a daily basis so I don't want the port open to all during that time. And I travel daily and connect with different IP addresses via my cell phone's hotspot. I want to knock on the port and then be able to login via Putty, FileZilla, Stash, Git etc via SSH and only via my current IP address. Running Ubuntu server 15.04 and 15.10 CLI, knockd was unreliable in that the daemon would inexplictely end, plus it would not handle repeating port-protocol knocks reliably. 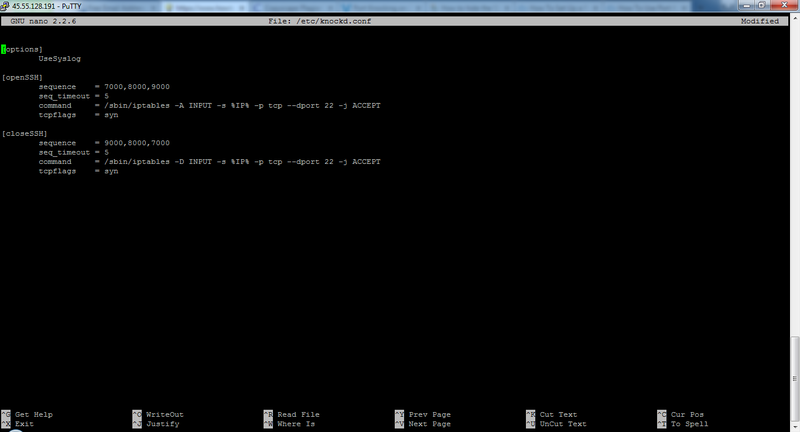 I coded my own iptables-only knock rules which are available via a bash-script installer on GitHub. I call it "POOFITEE". Toally free, it installs iptables rules and does not have any daemon aspect that can drop dead just when you need it to work like knockd did for me. It features two styles of knocking that I call strict rules and loose rules. There are other options in POOFITEE, some in development stage, but the two port knocking options are fully working. Please let me know if you have any success or difficulties with it, and I can help. I unashameably lift up the Lordship of Jesus Christ in the project's copyright message, and that aspect of it is absolutely not negotiable. Lord bless! Shouldn't the [closeSSH] command end with DENY? 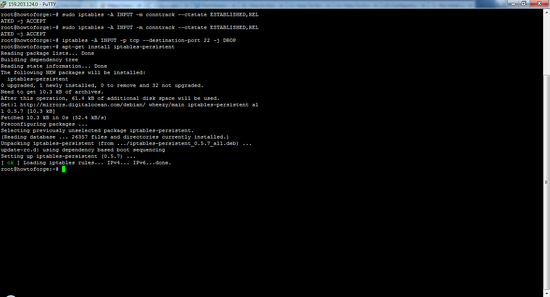 As it is, the commands for both [open/closeSSH] appear to open port 22, which is not what it is supposed to do. This will keep the port open indefinitely for every IP address you use it from. Don't blindly copy and paste code from general how-to sites like this. Serverfault or the official docs ( run "man knockd" or "man iptables" ) are usually much safer. Also, this method won't work as-is on an Amazon AWS VM because firewall rules are set in the AWS management console under Security Groups.